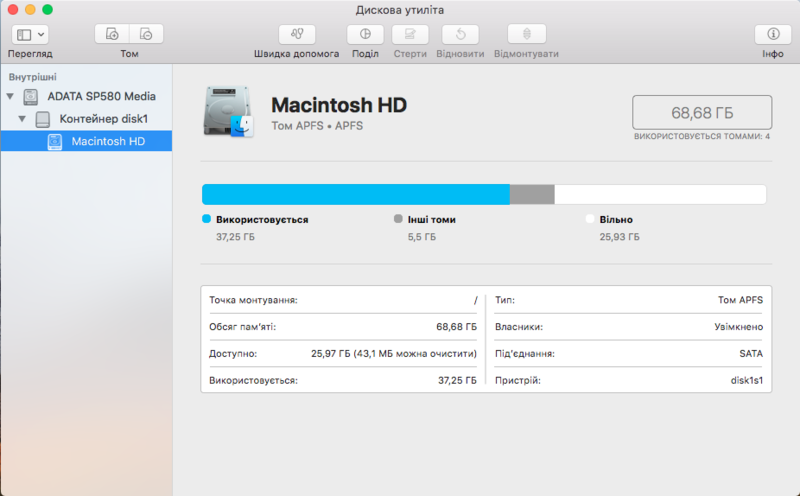 On a 120GB SSD hard drive in a MacBook only 68.68GB are available. The missing 51.32GB are not even shown as a free space. As you can see on the first screenshot the disk has 120GB. However, the partition chart on the same screenshot only shows 68.7GB. Also the other two screenshots show that only 68.7GB out of 120GB seem to be available. Below is the offsets and sizes of the two partitions on the drive. The offset of disk0s1 is 409,600 bytes. The size of disk0s1 is 209,715,200 bytes. The offset of disk0s2 is 51,351,912,448 bytes. The size of disk0s2 is 68,682,190,848 bytes. Using the above data, the space between the partitions can be computed, as shown below. 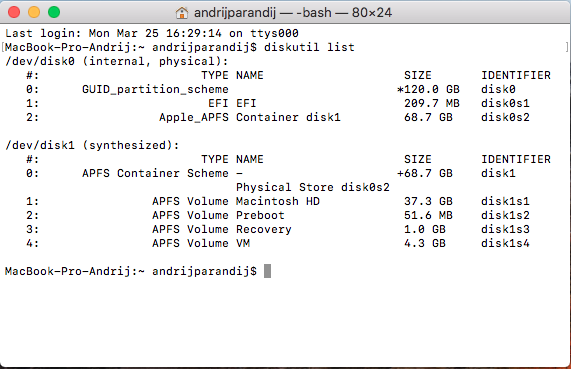 The command given below adds free space found immediately after disk0s2 back to the APFS container inside the partition. 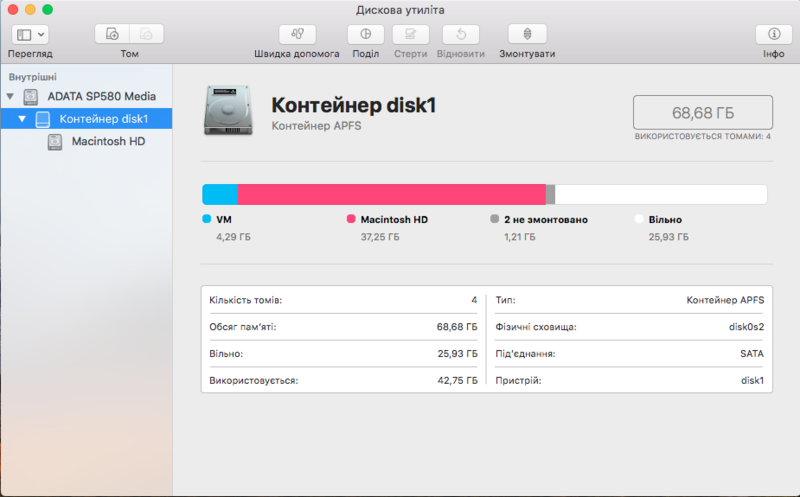 Since the 51.1 GB of free space occurs immediately before disk0s2, the command given above will not be able to return this free space back to the APFS container. The easiest course for action would be to backup, erase the drive and reload. While it may be possible to use macOS to fix the drive without using a backup, this would require creating two APFS containers on the same drive. Apple did not design macOS to handle multiple APFS containers on the same drive and should only be attempted by advanced users. Another possible solution would be to use third party software to move the APFS container partition (disk0s2). One possible pay utility is offered by Paragon. The free GNOME Partition Editor (GParted) utility reports being able to move APFS partitions. Download the gparted-live-0.33.0-2-amd64.zip file. I assume this file will download to your Downloads folder. After the download completes, the zip file will be automatically convert to a folder named gparted-live-0. 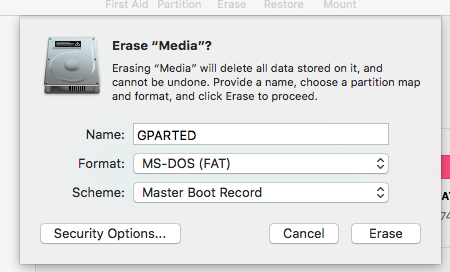 Resize an operating system's partition?